Tue, Sep 11, 2018, 12:08 pm SL Time, ColomboPage News Desk, Sri Lanka. 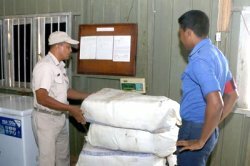 Sept 11, Colombo: The Sri Lankan navy has arrested three persons transporting a stock of Kerala cannabis in the territorial waters of the island on Sunday. The crew of a Cedric boat attached to the Northern Naval Command while on patrol apprehended the three suspects with 118 Kg of Kerala Cannabis in the seas 10 nautical miles off light house-Point Pedro, on 9th September, the Navy Media Unit said. This haul of cannabis, estimated to be valued at Rs. 12 million, was concealed in 48 packs and suspected to have been tried to bring from India by a small craft. The suspects who are residents of Jaffna and Mannar areas, are in the ages of 32 and 36 years. The apprehended suspects along with the haul of cannabis and small craft were handed over to the Kankasanthurai Police for onward legal action.